NASA obtained data from its latest observation campaign of the Ball Aerospace-built Kepler spacecraft, despite the observatory having only a little amount of fuel onboard. The space agency said Friday it put the space telescope on hibernation mode after NASA found that the craft’s tank was running on low fuel. Kepler was roused from sleep Aug. 2, when the agency downloaded science data from the Campaign 18 by maneuvering the vehicle’s large antenna to dispatch the information. The agency expects the spacecraft to help astronomers discover new exoplanet candidates and affirm existing ones via findings from its 18th observation effort that commenced May 12. 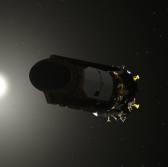 Scientists will continue to study data already on the ground from Kepler’s other campaigns. To date, 24 new planet discoveries have already emerged from the 10th observation campaign, joining the spacecraft’s list of 2,650 confirmed planets. Ames Research Center oversees Kepler’s mission concept, ground system development and K2 mission operations for NASA’s science mission directorate. The agency’s Jet Propulsion Laboratory managed the spacecraft mission development project.